The Energy Systems and Planning branch is responsible for the design and implementation of the state’s comprehensive energy ecosystem and energy assurance plans related to Hawaii’s integrated utility grids, pipelines, fuels, and infrastructure. 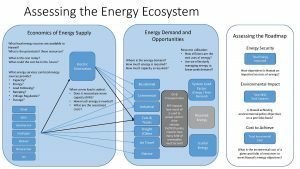 Also under the purview of the Energy Systems and Planning branch is devising and deploying statewide clean energy plans, policies, and strategies for reducing petroleum use in the electricity and transportation sectors, increasing renewable penetration at lower costs to ratepayers, and ensuring energy security. 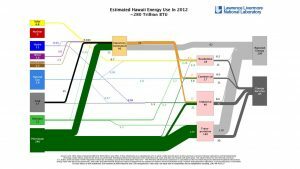 The chart below from the Lawrence Livermore National Laboratory captures the scope necessary for comprehensive energy planning in Hawaii by illustrating the flow of energy into the state in its various forms and efficiencies through to end uses. An energy flow chart such as this one depicting resources and their use represents vast quantities of data. Energy flow diagrams change over time as new technologies are developed and as priorities change. 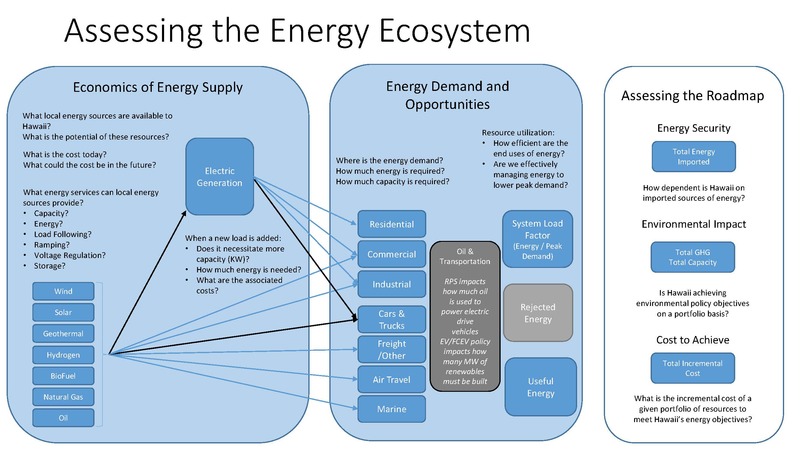 Assessing and planning for an integrated energy ecosystem involves rigorous analysis and modeling on both sides of the energy supply and demand equation and across sectors to provide clarity around embedded issues that will move important metrics such as costs, energy security, and environmental impact that can be used in assessing and comparing the key decision points on the clean energy roadmap.